Coventry's, Leamington Spa's and the Midlands leading private coach hire operator. Ideal for inbound tours, private and coporate events. 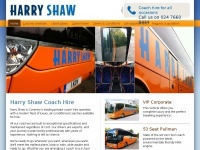 two profiles were found for Coventry-coachhire.co.uk in social networks. Among other social networks the website is represented in Facebook and Twitter. The web server used by Coventry-coachhire.co.uk is located in Great Britain and run by Rackspace Ltd.. On this web server 29 other websites are hosted. The language of those websites is mostly english. The Coventry-coachhire.co.uk websites were developed using the programming language ASP.NET and served by a Microsoft-IIS server. For managing the data of the webpages the CMS DotNetNuke is used. XHTML 1.0 Transitional is used as markup language on the webpages. To analyze the visitors, the websites uses the analysis software Google Analytics. The website does not specify details about the inclusion of its content in search engines. For this reason the content will be included by search engines. The visitors are redirected to the homepage of the website "/home".